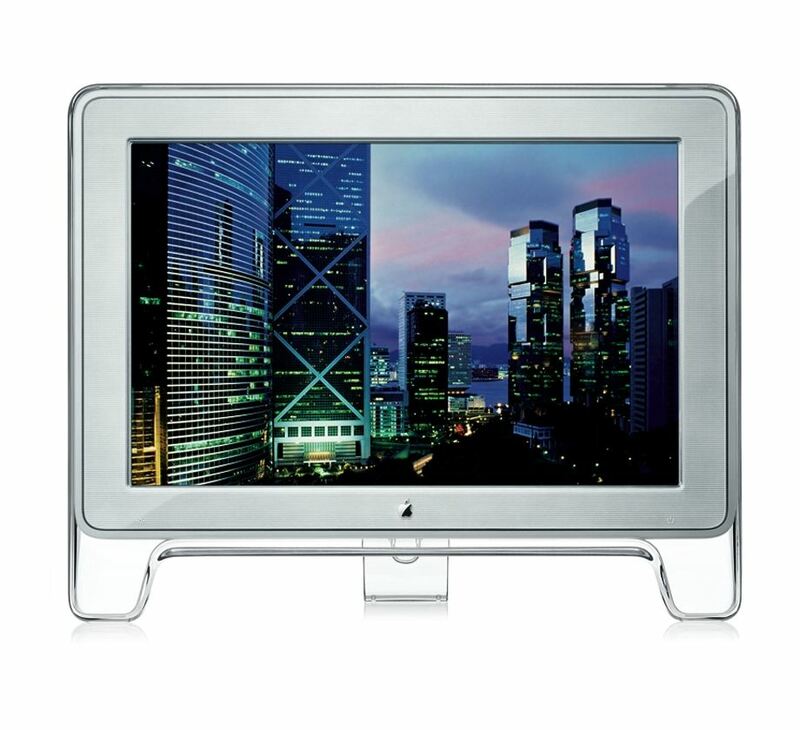 The Apple Cinema Display HD (High Definition, 23-inch) is an active-matrix LCD matte display, with a maximum resolution of 1920 x 1200 pixels. As the moniker HD implies, this display is designed for HDTV content playback. It has a higher contrast ratio, brightness, as well as a wider viewing angle which enhance the viewing experience greatly. 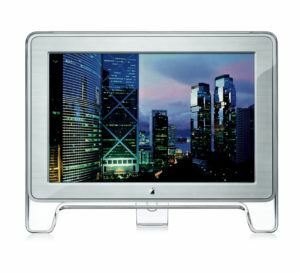 Apple Cinema Display HD (23–inch) is enclosed in a high-density, crystal-clear polycarbonate frame, which is mounted on an easel-style stand with an integrated two port USB hub. It has an ADC (Apple Display Connector) for analog and digital video input\output, USB data transferring, as well as a power supply. The Apple Cinema Display Original (22-Inch) is compatible with any Mac that has an ADC connection and a video card with 32 MB or more of video memory. Optimum resolution (pixels): 1920 x 1200. Supported resolutions (in pixels): 800 x 500, 1024 x 640, and 1280 x 800. Viewing angle: 170 degrees horizontal, 170 degrees vertical. Supported MacOS: 9.2.2 or X 10.1.3. Dimensions: 19.2 x 24.2 x 7.3. Operating temperature: 10° to 35° C (50° to 95° F). Relative humidity: 20% to 80% (noncondensing). Altitude: 0 to 3048 meters (0 to 10,000 feet). Before you lift or reposition your display, disconnect the cables and power cord. Always use correct lifting techniques when positioning the display. When lifting or carrying the device, grasp the edges and never lift the display by the stand or the cord. Turn the cinema display off and disconnect the power. Use the cloth that came with the display or another soft, dry cloth to wipe dust from the screen. Warning: Don’t clean the screen with a cleaner that contains alcohol or acetone. Use a cleaner intended for use with an LCD (liquid crystal display). Never spray cleaner directly on the screen. It may drip inside the display and cause an electrical shock. Use only the power adapter that came with the device and the AC cord that came with the Apple’s power adapter. Keep in mind that adapters and cords for other electronic devices may look similar, but using them may affect your display’s performance, or even damage the display. The AC power cord has a plug that has a third grounding pin. This plug will only fit a grounded AC outlet. If you are unable to insert the plug into an outlet because the outlet is not grounded, contact a licensed electrician to replace the outlet with a properly grounded outlet. Arrange the display so the top of the screen is slightly below eye level when you’re sitting at the keyboard. 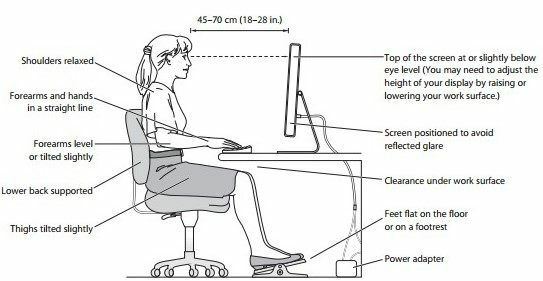 The best distance from your eyes to the screen is up to you, although most people seem to prefer 18 to 28 inches (45 to 70 cm). Position the display by tilting it up or down in order to minimize glare and reflections on the screen from overhead lights and nearby windows. Shoulders should be relaxed, forearms and hands in a straight line, forearms level or tilted slightly, lower back supported, and thighs tilted slightly. The top of the screen should be at, or slightly below eye level (You may need to adjust the height of your display by raising or lowering your work surface). The screen should be positioned to avoid any glare. Keep plenty of clearance under your work surface so that your feet have room to stay flat on the floor, or on a footrest. Before taking any of the steps mentioned below, make sure the computer is turned on. All the cables must be connected properly to the computer and display. Make sure your computer is not in Sleep Mode. Verify that the display’s USB and FireWire cables are in place and plugged in to the computer correctly. The ports on the back of the display only work if these cables are firmly attached to the computer. If part of the screen is dim, or if the screen does not have an image: After the display has been turned on, it may take several minutes for the device to reach the full operating brightness. Make sure the display brightness controls are set properly. Use the brightness buttons on the side of the display. You can also choose Apple Icon > System Preferences, and click Displays. If a portion of the screen remains dim after the display has warmed up, and the white LED on the front of the display is flashing a repeating pattern, contact an Apple authorized reseller or service provider. This 23-inch model was dubbed the Cinema HD Display, because it supports a full 1080 pixels resolution. The iSight webcam can be mounted on this display. There’s a round hole in a display stand to put the wires through. The 23-inch model Cinema Display was dubbed the Cinema HD Display, and supports a full 1080 pixels resolution. On June 28, 2004, Apple introduced a redesigned line of Cinema Displays, along with a new 30-inch model which, like the 23-inch model, carries the Cinema HD Display name. See also: Apple Cinema Displays Error Codes for more details about possible troubleshooting codes for Cinema Display HD. Getting ready to recycle your old Apple Cinema Display? We at iGotOffer buy your used displays for top dollar cash: Sell My Cinema Display online now! Apple Cinema Display – User’s guide. Video uploaded by Siivel on April 16, 2016.